A local paper covered my exhibition. Here is a link to the article. It is in Danish. See the link below for English translation. 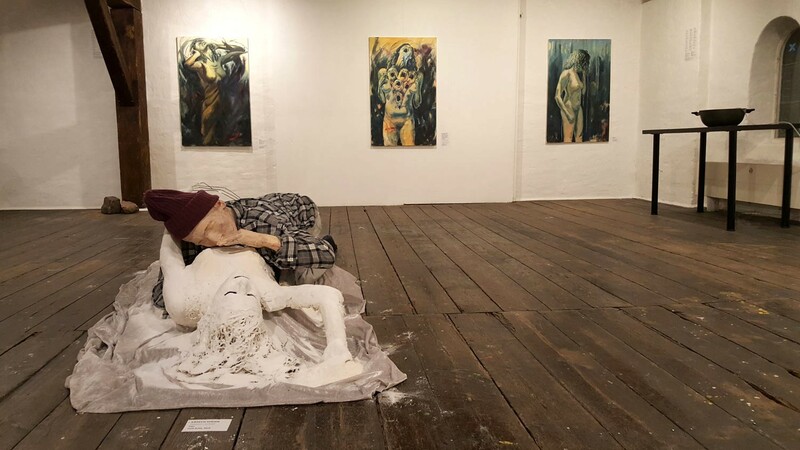 Aktuel Udstilling på Stadens Museum for Kunst, Christiania frem til og med 1. dec.
Four years ago, with a few red dotted rejections from the Artists’ Autumn Exhibition under the belt, I took a mask and threw myself into the central reservation with a – for me – brave protest action. 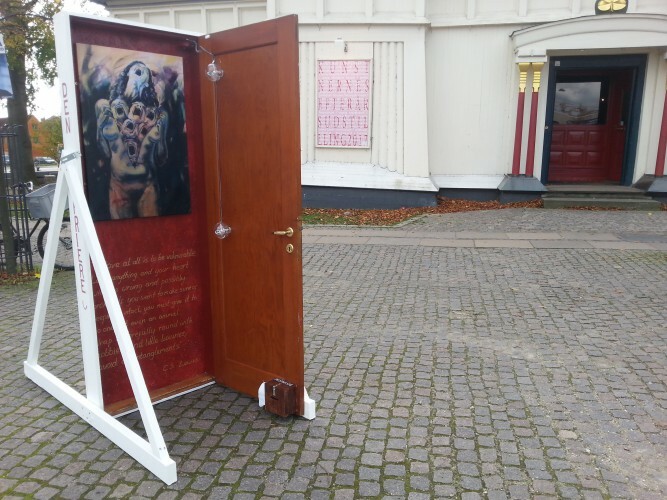 The road then led to Christianshavns Slotsplads, Kongens Nytorv, Istedgade and further into all sorts of art projects, where art has become a mouthpiece with very direct contact between the artist, the work and an audience. The topics included “war and the refugee crisis”,Social care”, and mental illness. 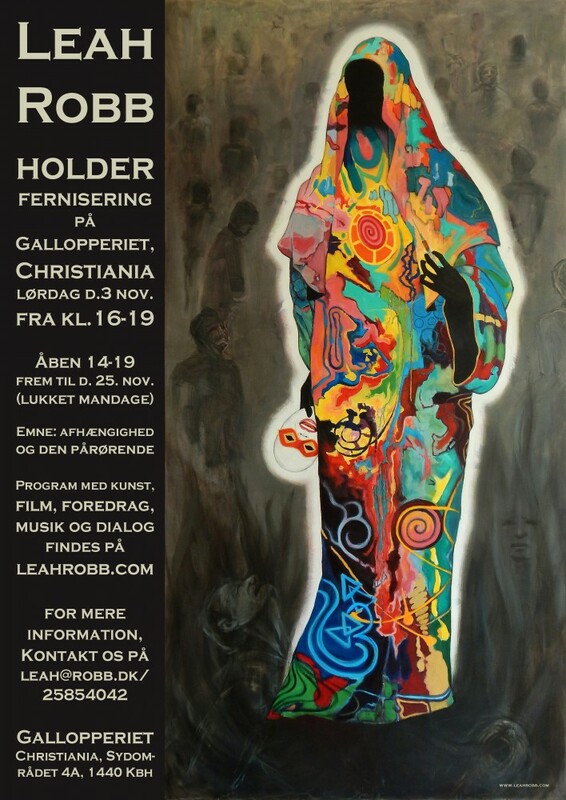 This year, my current exhibition at Gallopperiet, Christiania, focuses on the world of addiction, because, as a friend of a relapsed addict, the subject has impacted me right into the inner chamber of my heart. The feelings are strong, the colours and the expression are sometimes black, but there is a glimpse of hope to be found in the midst of the darkness. Experience an emotional roller coaster through an exhibition ranging from painting, sculpture and concept art to a Dialogue corner, where guests can contribute, and an Interactive labyrinth Installation. The installation was made in collaboration with two artists who are recovering after a long period of drug abuse, which almost sucked them into the abyss. Take the journey with them and me into a world where there is more than ample ‘substance’ for reflection. For fire år siden, med et par røde prikkede afslag fra Kunstnernes Efterårs Udstilling under bæltet, tog jeg maske på og kastede mig ud i midterrabatten, med en – for mig – modig protestaktion. 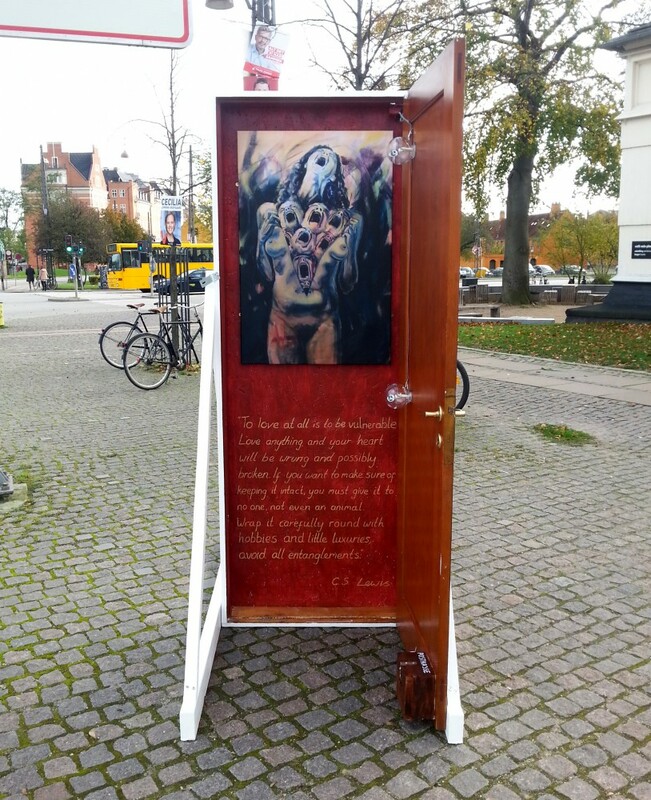 Vejen førte derefter til Christianshavns Slotsplads, Kongens Nytorv, Istedgade og videre ud i alle mulige kunstprojekter, hvor kunsten er blevet til et talerør med meget direkte kontakt mellem kunstner, værket og et publikum. Emnerne inkluderede krig og ‘flygtninge krisen’, næstekærlighed og psykiske lidelser. I år har min aktuelle udstilling på Gallopperiet, Christiania, fokus på stoffernes verden, fordi, som pårørende til en tilbagefalden misbruger har emnet rørt mig helt ind i mit hjertes indre kammer. 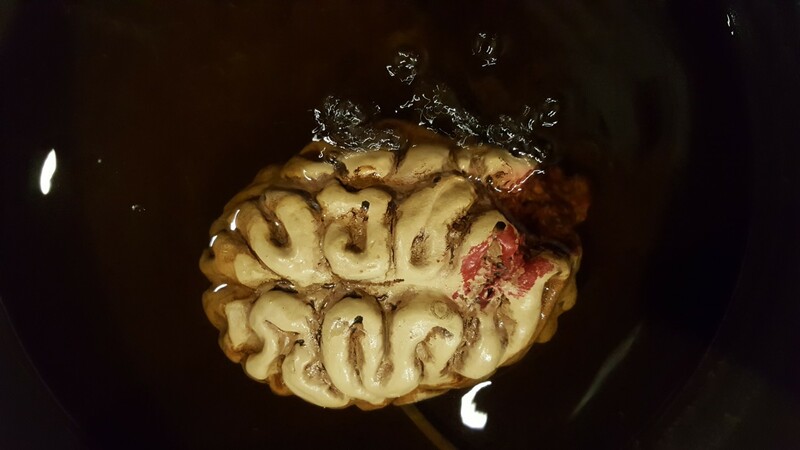 Følelserne er stærke, farverne og udtrykket er til tider sorte, men der er et glimt af håb at finde midt i mørkets hvirvl. 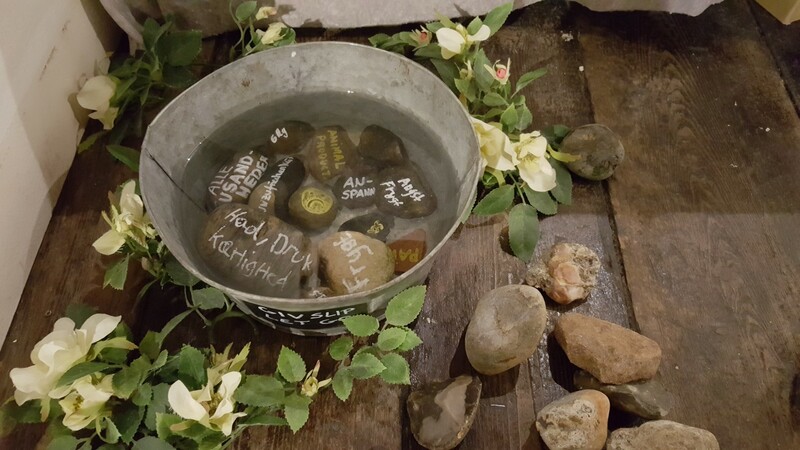 Oplev en følelsesmæssig rutschebane igennem en udstilling, der spænder fra maleri, skulptur og konceptkunst, til en Dialogkrog, hvor gæster kan give bidrage, og en Interaktiv Installation. 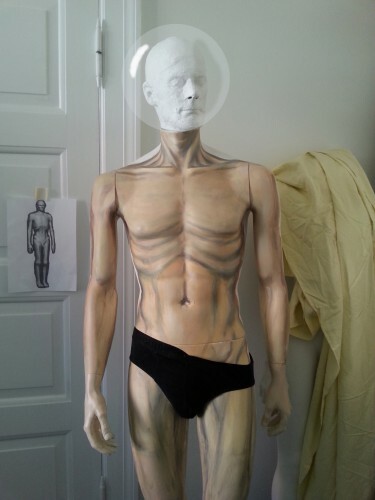 Installationen er lavet i samarbejde med to kunstnere, der er i bedring efter et langt misbrugsforløb, der næsten førte dem i afgrunden. Tag rejsen med dem, og mig ind i en verden, hvor der er mere end rigeligt ‘stof’ til eftertanke. Har du spørgsmål, kan du ringe på 50233126. Bemærk at udstillingen er blevet forlænget til og med d. 1. dec.
Plakaten vil være til salg på Gallopperiet. The poster will be available at Gallopperiet. 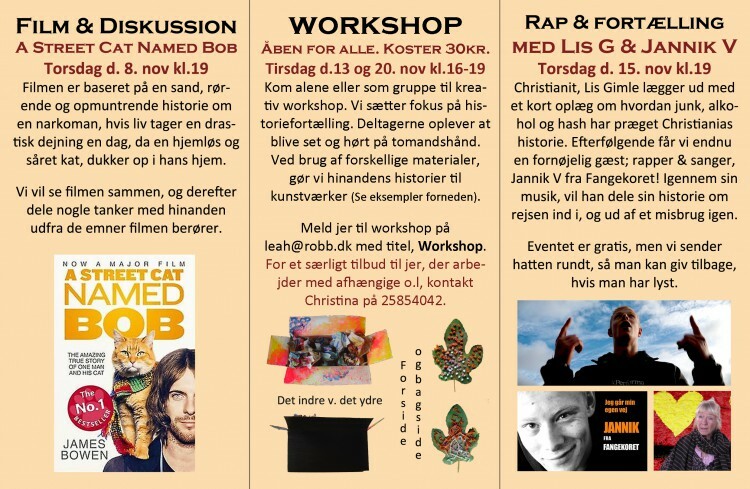 Invitations in English and Danish to up-coming November exhibition. Feel free to print these out and share. 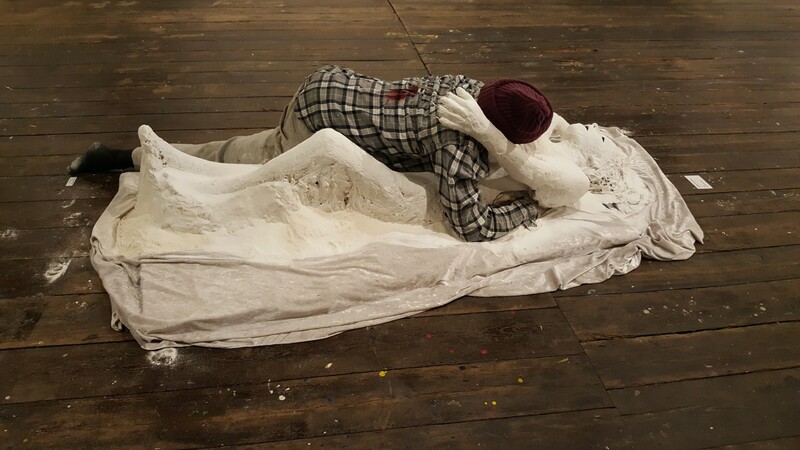 This sculpture deals with love and betrayal. Model and form are one. The left arm has been left for later as there is a plan for this one that would make it too vulnerable to do now. I’m using jute to strengthen the plaster. Next morning she was ready to be strengthened. 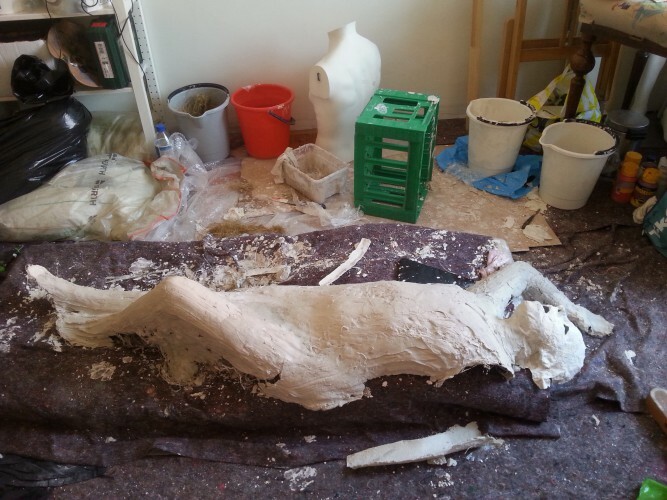 I turned her over and put more plaster and jute in the back of the mould because I will not be making a cast from it. 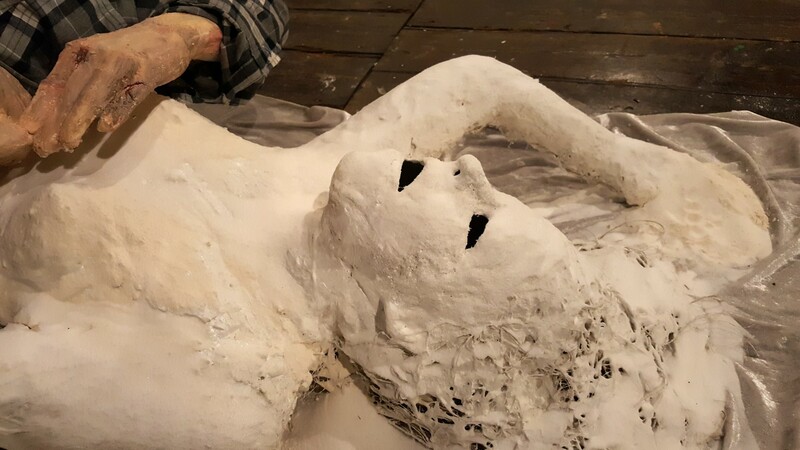 Creative Process: Mould-making, casting and a melt-down. 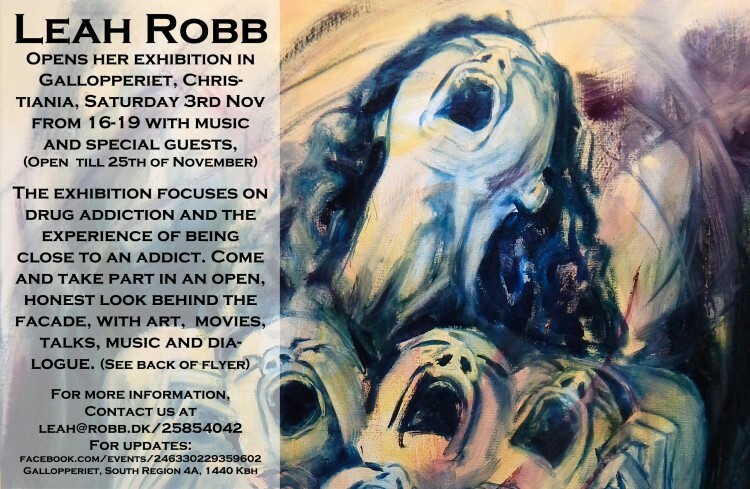 My up-coming exhibition deals with addiction and its effects on the addict and their close friends and family. It is a tough subject and pretty painful. This artwork is proceeding slowly, but surely. I won’t say too much but just let you have a look behind the studio doors. 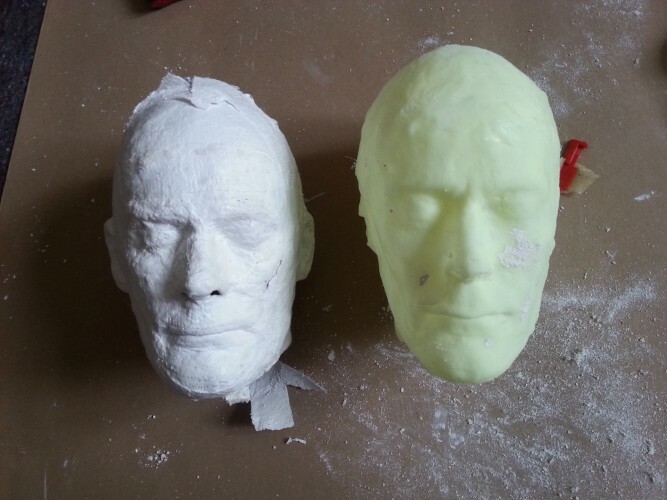 Making the mould. I like to leave the mouth and eyes till last so the model doesn’t feel too claustrophobic too soon. 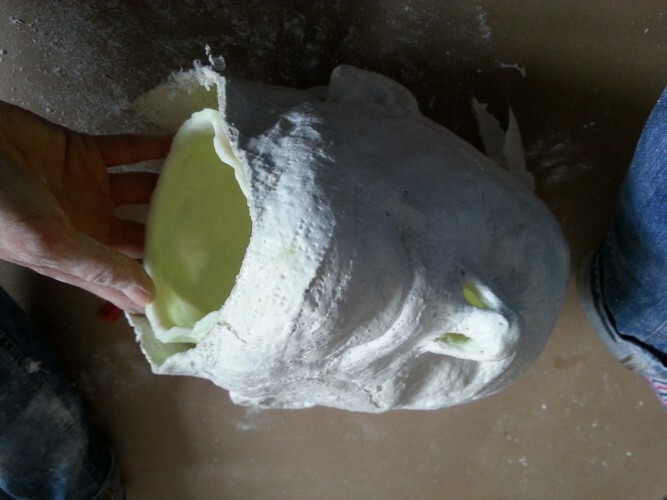 First time to make the plaster cast of the head. 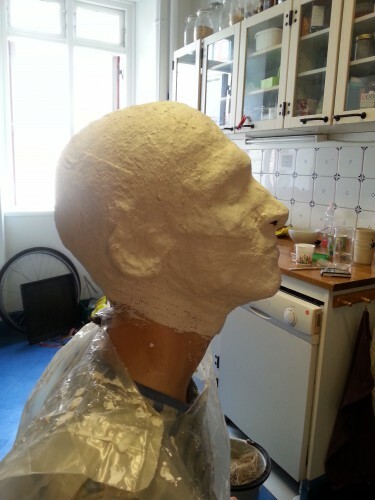 There is a split in the back of the head so that it will be possible to pull the cast off. Apparently the caption should be, “I think, therefore I am”. 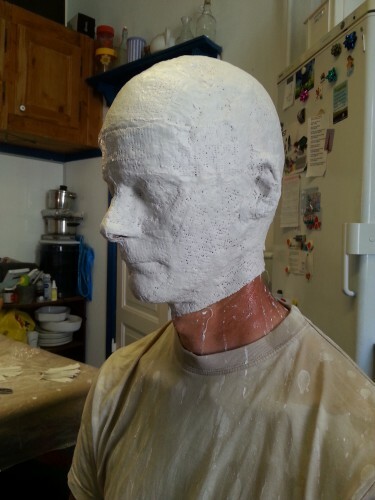 The plaster head once finished. This is kind of what I’m aiming at. I am just struggling to find these plastic spheres, so this is a photoshopped one. I found a supplier in the States, where I could get 4 spheres for $70. But to have them shipped by UPS would have cost $218! What??? So, that was cancelled! 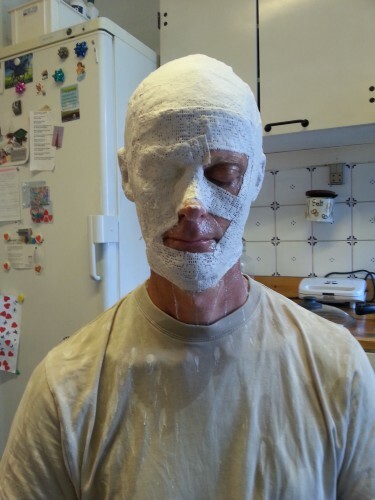 The moment when the luminous, translucent head had hatched! I had to form the ears by hand afterwards. 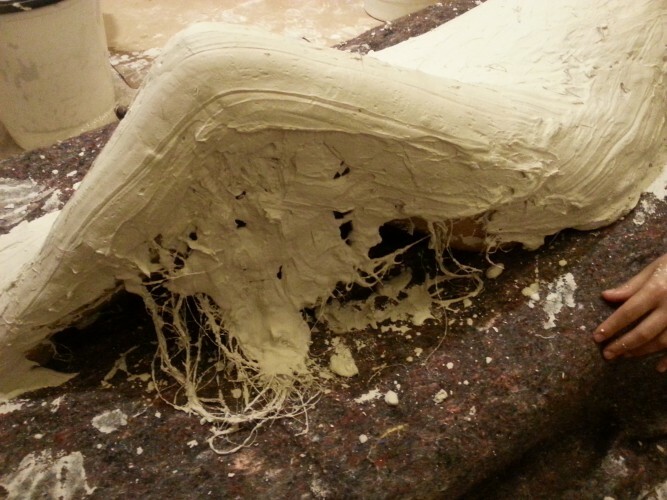 Hard to believe that cast could fit into that mould! 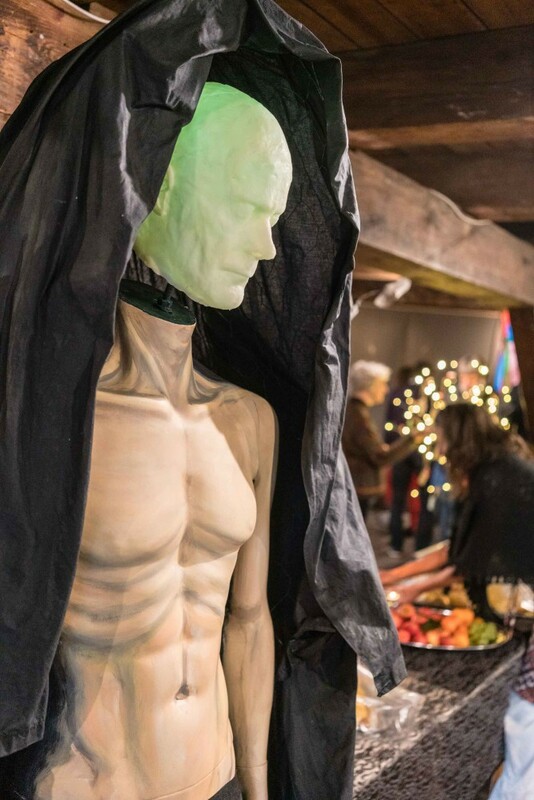 The idea with the translucent head is that I want to put light inside to give the impression that there is internal activity that the outside world is not able to participate in. That is what drugs create – an affair with another reality. 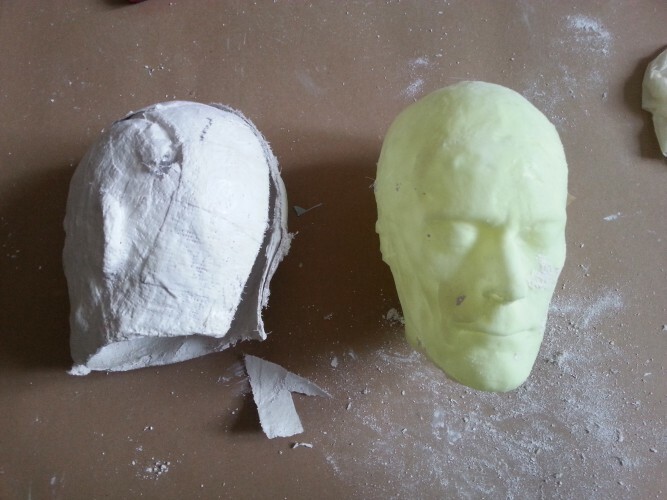 Here is the translucent cast from the plaster mould. The ear has now been formed. I had a meltdown – literally. Once I’d modelled the ears I put the head back in the oven on its side. But I hadn’t accounted for that Cerenit softens when hot and the head couldn’t keep its form, and broke into about 6 pieces! I tried to keep my composure, and with a bit of super glue, pieced it together bit by bit. A friend suggested a hair-dryer. 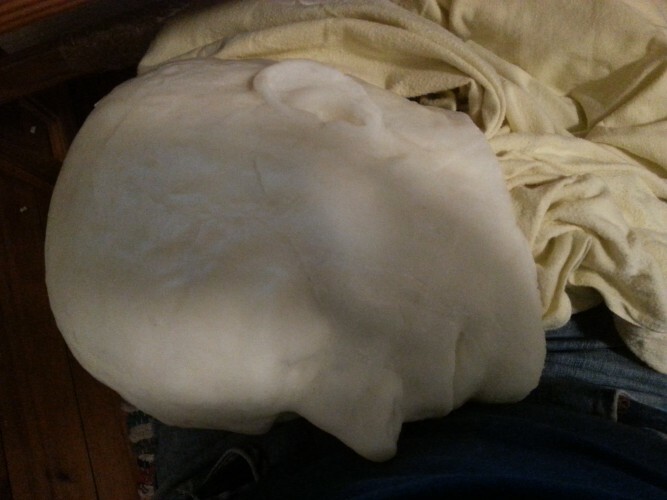 But I realised the same thing could happen here, so I stuffed a blanket inside the head to keep its form. 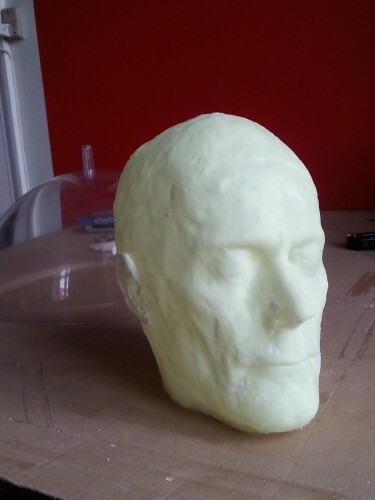 The ears are now sufficiently hardened and the head is whole again. Friday 31 August Kl. 14.00-16.00, Århus, Denmark. The John Cleese Festival begins with the opening of a python art exhibition and tour of the festival’s installations, video screens and artworks – and a talk: What is art? And what is amusing? 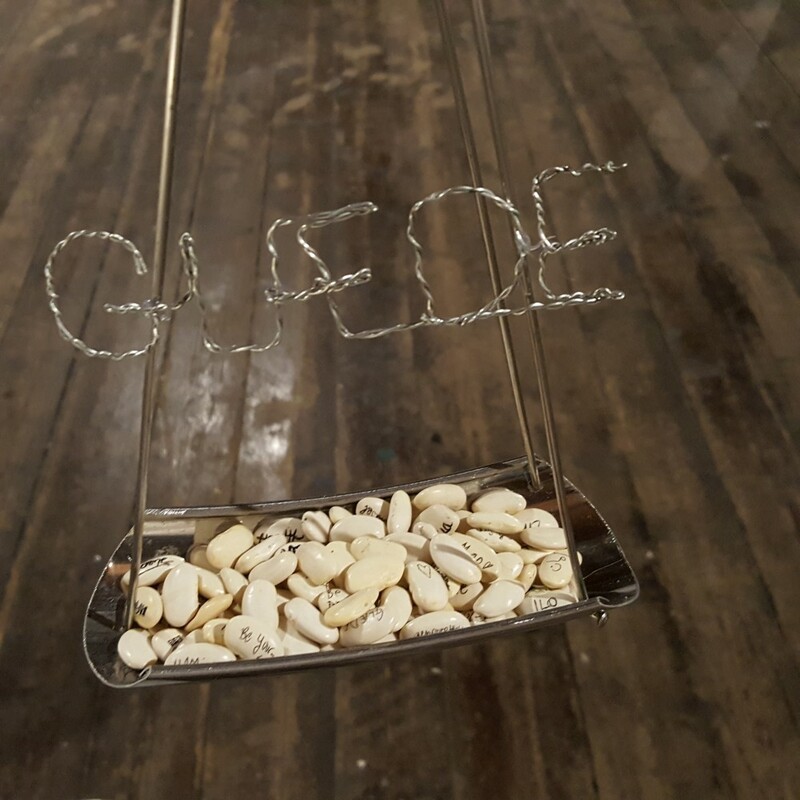 An exhibition about humor and art raises two major questions: Is it art? Does it make you laugh? Among other contributions. 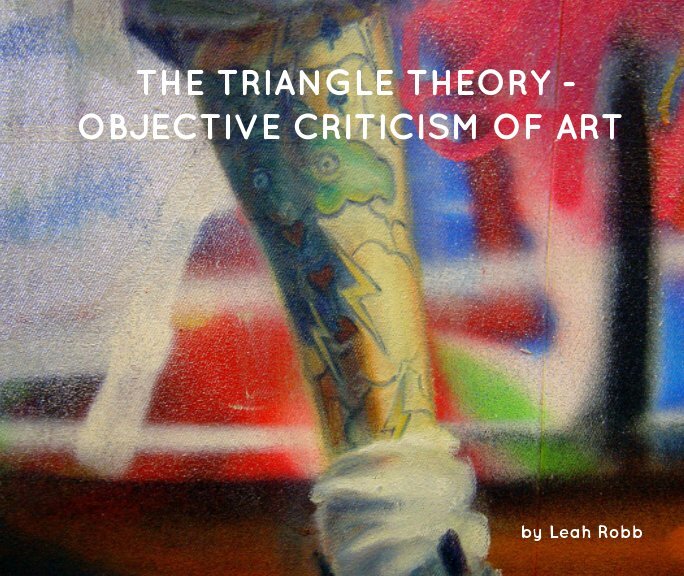 we have the artist Leah Robb, who will refer to her painting of the comical artist, Otto Frello when presenting her Triangle Theory – a tool she uses to judge whether a work has artist merit or not. There will be debate and bubbles. Fredag 31. august Kl. 14.00-16.00, Århus. John Cleese Festival åbner med en fernisering af en pythonsk kunstudstilling og rundvisning i festivalens installationer, videoer-screens og kunstværker – og en talk: Hvad er kunst? Og hvad er sjovt? 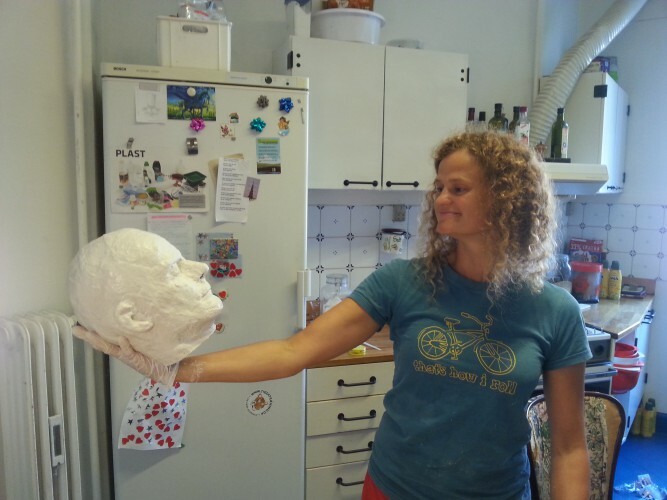 En udstilling om humor og kunst rejser to store spørgsmål: Er det kunst? Er det sjovt? Bl.a. 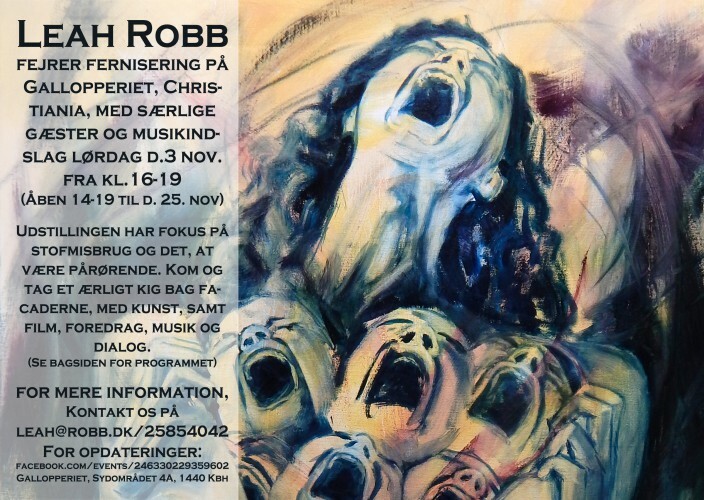 har vi kunstmaleren Leah Robb, som tager udgangspunkt i sit maleri af den komiske kunstner, Otto Frello, når hun præsenterer sin Triangel Teori – et redskab til at bedømme om et værk er kunst. Klik på linket forneden for mere info. Der bliver debat og bobler. New and improved Triangle Theory book available through Blurb! I am excited to announce that I have updated my Triangle Theory book and it is now available through Blurb. There are some pages for preview. Signe Sylvester, som interviewer har kørt et kursus, der hedder, “Gør Kunsten til din Levevej”. Den har jeg deltaget i, og fået nogle gode tips om, hvordan man forbliver tro overfor sig selv, samtidig med at leve af det, man brænder for. Kan varmt anbefales. For over a year I’ve been working on paintings dealing with the nature of addiction and what it is like to love someone who is struggling with it. I am still learning about the way in which my life has been affected by this, both positively and negatively. 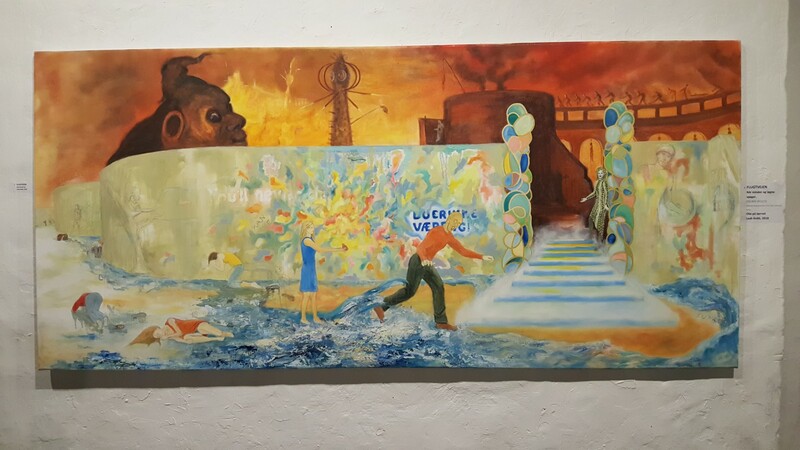 These artworks are therefore a personal journey and an attempt to start a dialogue between myself as a co-dependant, (consumed by the plight of the addict), those with an addiction and anyone else who joins the conversation. I will post pictures and sketches here in my blog for you to see, in anticipation of exhibitions in the latter stages of 2018. 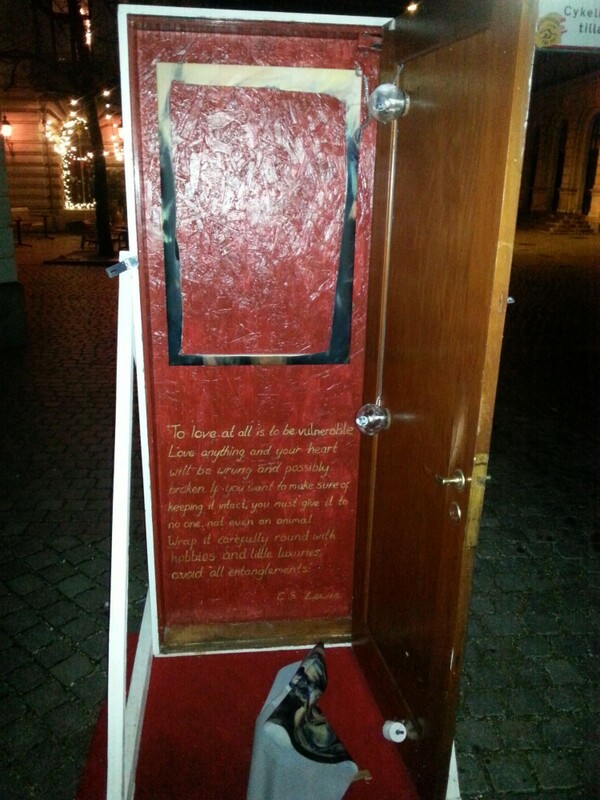 This is the first time I am showing the content of this door on-line. More about that in a moment. The door is my exhibition space. 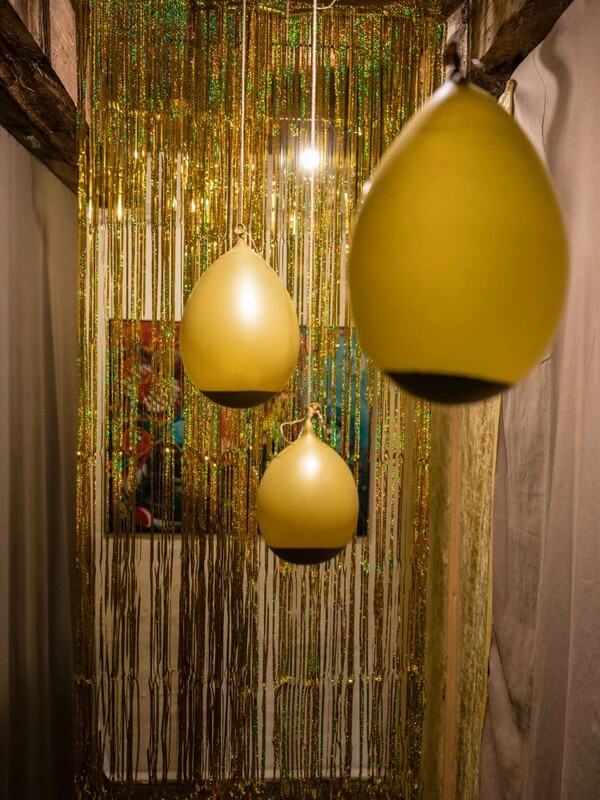 It originally was made to stand outside Den Frie/The Independent exibition, because they house KE – a Censored Exhibition – every year that I feel has a counterproductive way of ‘promoting’ up-and-coming artists. It costs between 550.1150kr to enter, with no need for accountability from the panel of judges. I therefore exhibit outside for free every year with the council’s permission and I’m sure that attracts more long-lasting attention than what is happening inside. It is quite entertaining really. Aloong the side of the door frame are the words; Den Friere – The More Independent, because my decision to use public space instead of Den Frie; The Independent, makes me freer! 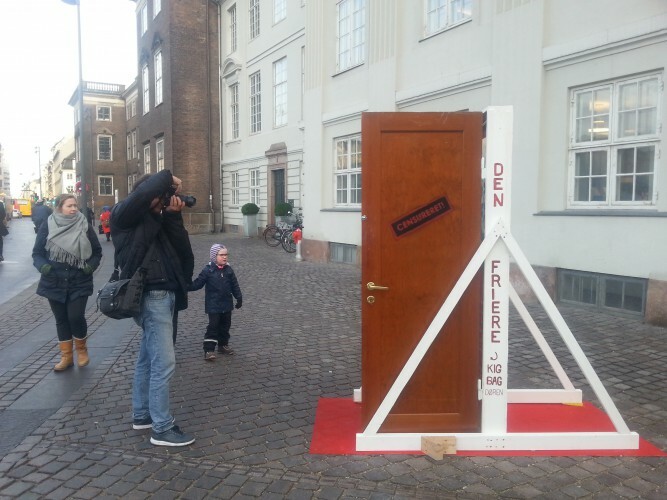 This is from the two week period the door stood outside Den Frie. 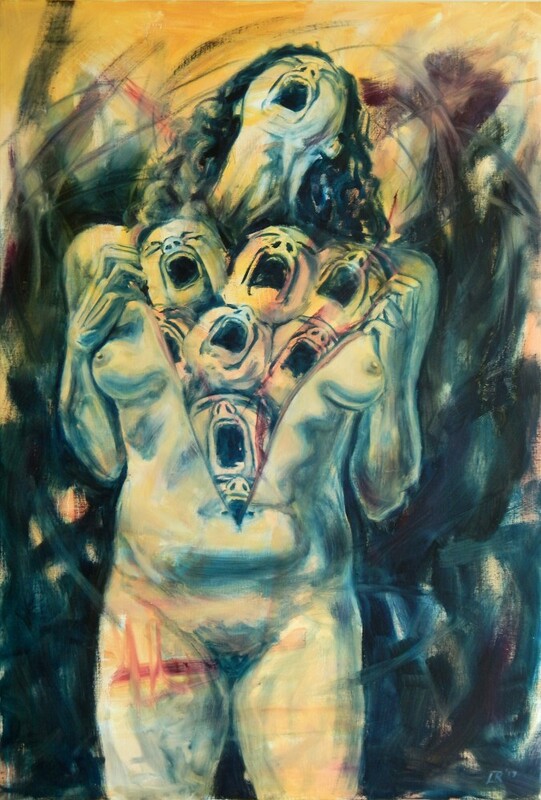 The painting itself describes the feeling of having a scream inside that you cannot contain. It needs to be released and the only way is for you to rip yourself open to relieve the pressure. 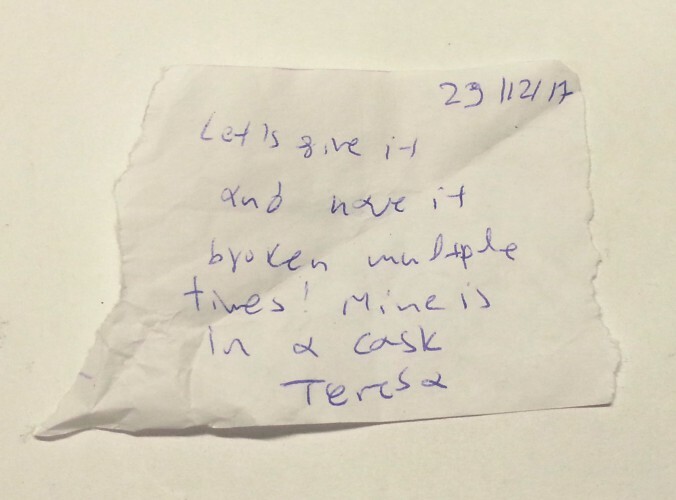 This emotion more specifically, came from the realisation that communication with someone dear to me was crumbling to dust and I seemed unable to stop the wrecking ball from swinging. A very painful period. 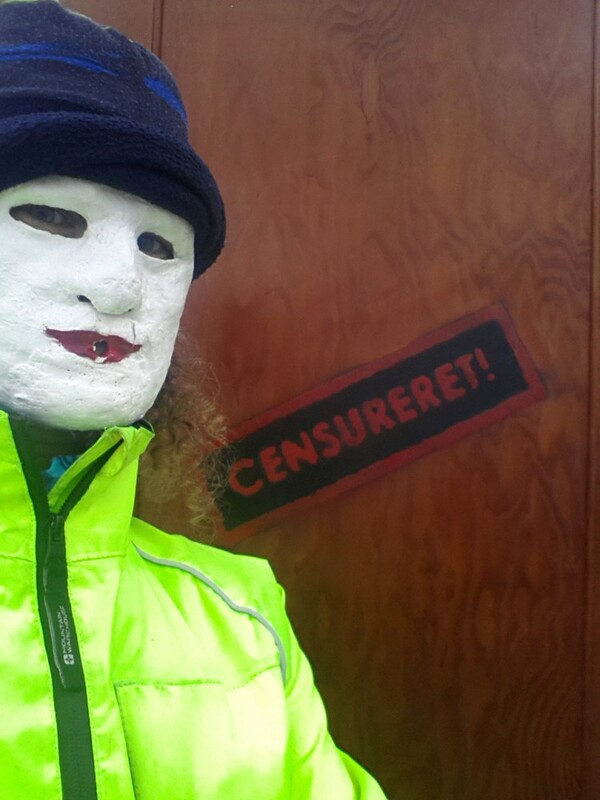 The reason for the mask is that Den Frie’s Censored Exhibition KE give ‘faceless’ rejections; just a red dot on-line. So I thought I’d remain ‘faceless’. The word on the door “Censored” can have several interpretations: 1. That me and my painting are censored by Den Frie in terms of being rejected. 2. 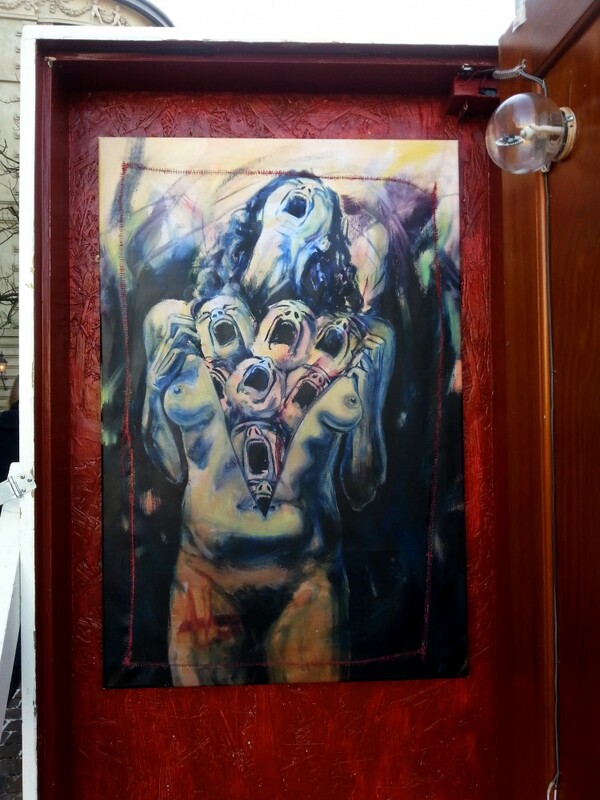 My painting being censored due to its naked horror. 3. 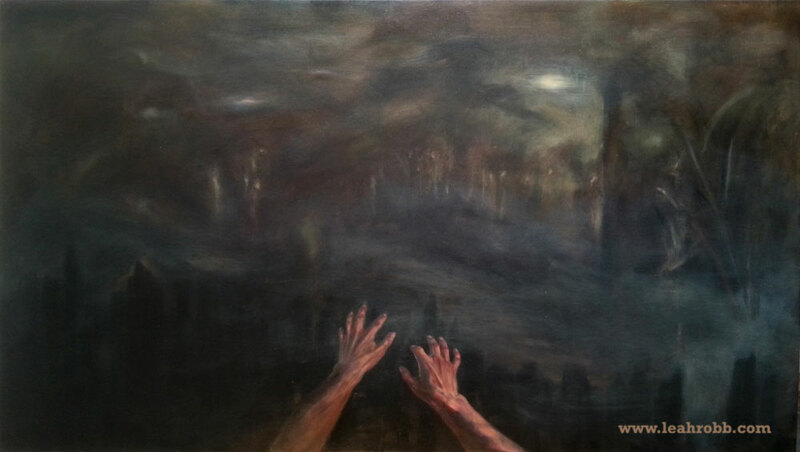 I as a person feel rejected by another person, and the painting is an expression of that feeling of rejection. This is the main motivation for the word on the door. 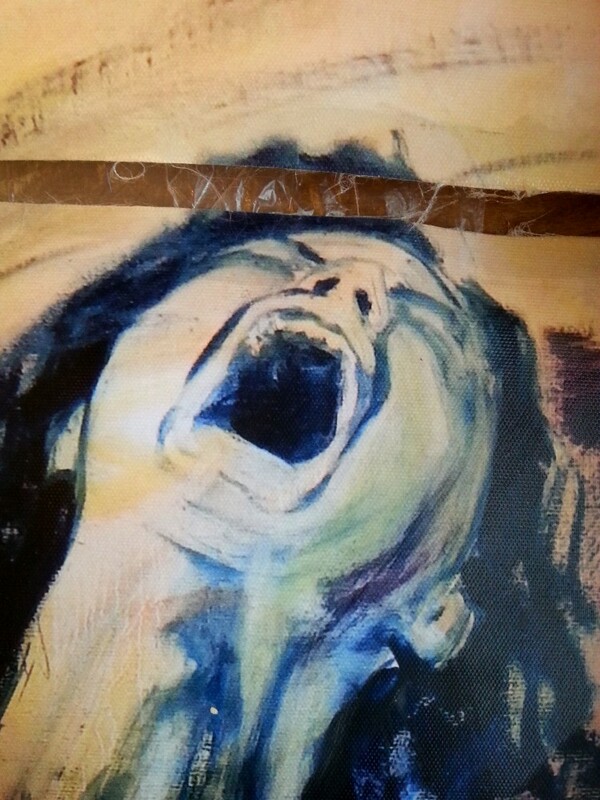 But the layered meaning is deliberate. 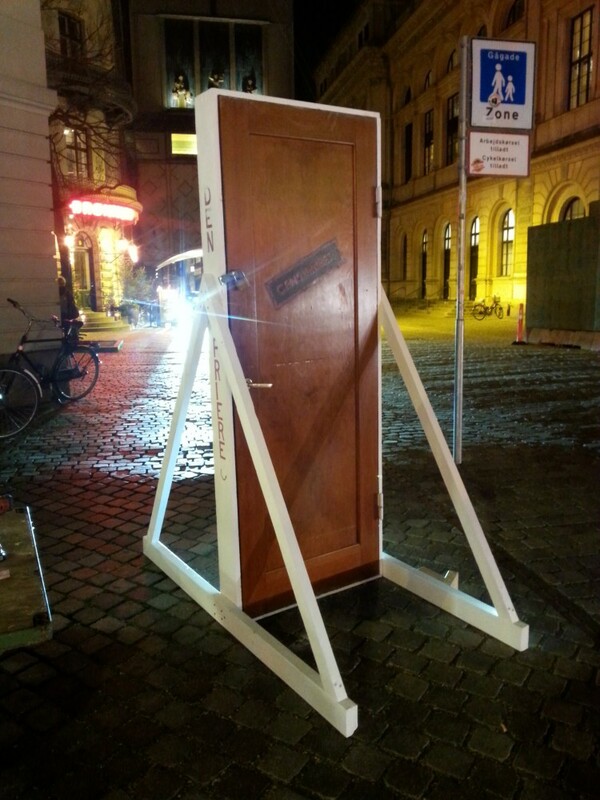 With permission from the council, I moved the door to Kongens Nytorv in November 2017 and it has been there since then. It has been visited by hundreds if not thousands of tourists and locals throughout the past 4-5 months. Here is a letter someone wrote to me, thinking I was C. S. Lewis. 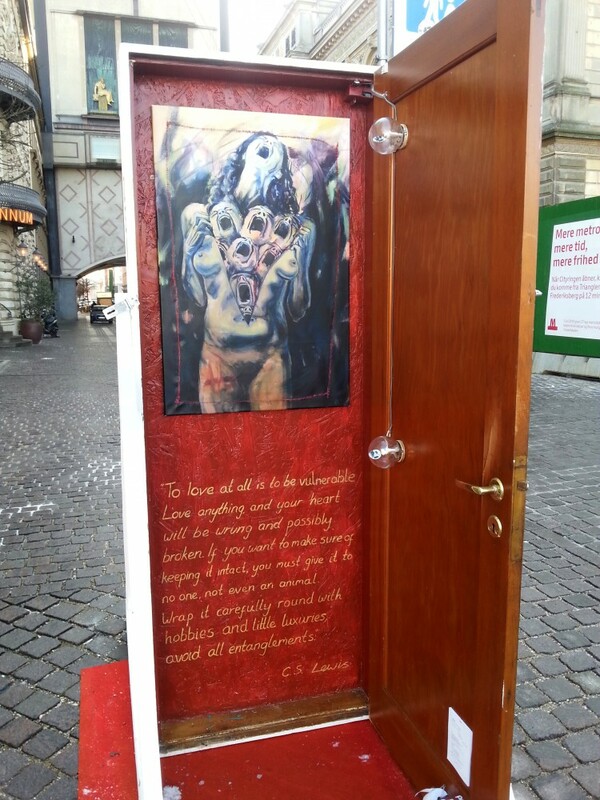 But C.S Lewis is who I quoted under the painting, not me. 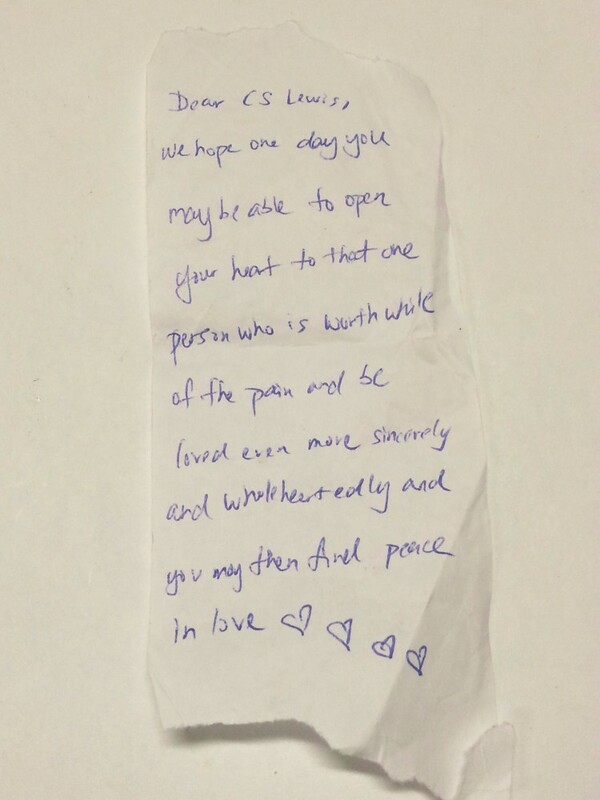 It was nontheless very touching and I appreciate the words of comfort that were expressed to me here. I like this message! Teresa has understood that love is worth the risk, but that it is a risk. I like the juxtaposition of the gentleness expressed between this couple and the horror of what it is like when love goes wrong, which they are witnessing. 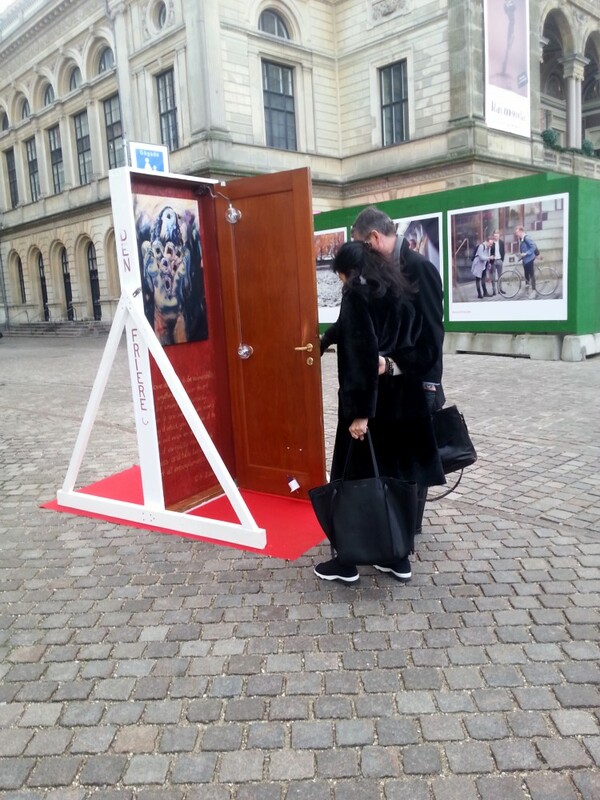 As I say, this is the first time I am posting pictures of the content of the door, but it is almost certainly not the first time it has been shown on-line by others. You see friends being photographed as they open the door. I like the intimacy that having a painting behind a door which you have to open yourself creates. Then, in february someone took a knife to my painting and cut it out of its stretcher! Sabotage! the wires to the lightbulbs were also cut. BUT, when you meet resistance and have a creative streak, you don’t give up or bow out. The sabotuer did not take the canvas with them, so I decided to try sewing it back in. I pasted contact glue around the seam on the back to stop the seam from running as soon as I started to sew. I used a strong thread to pull the canvas seam tight once the glue was dry. It was impressively effective considering the amount of tension needed to close all of the seams. 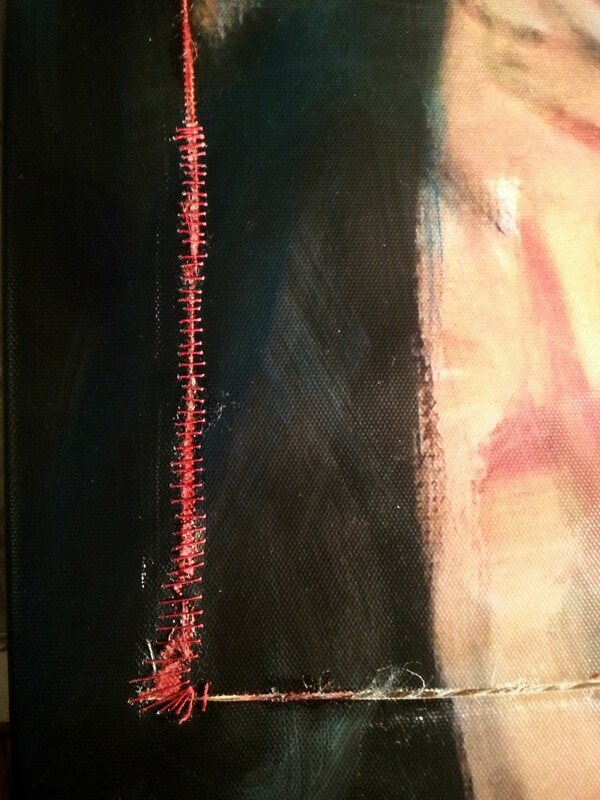 I deliberately used a red thread and a varied stitch to create what could look like a sewn together flesh wound. 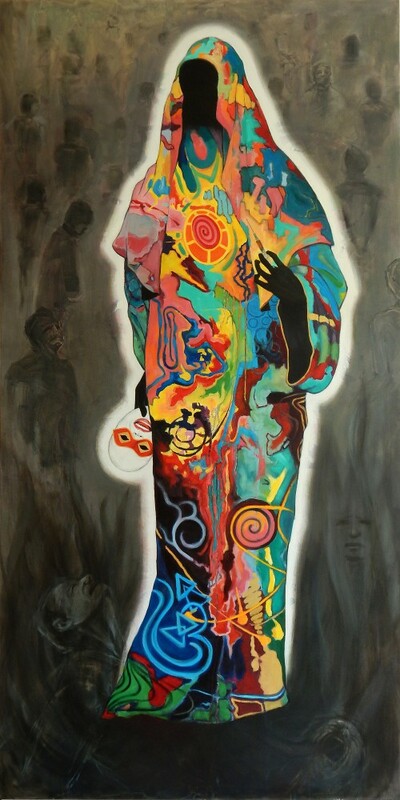 Back to the content: The painting is called “To Love” and deals with the vulnerability of love. Love is the strongest emotion and can lead to the deepest pain. The quote is by C.S. Lewis and says it like it is; love makes vulnerable. If you don’t want to be vulnerable, then don’t let your heart love anyone or anything. He is not saying, don’t love, he’s just explaining the natural cost. So here is the new improved version of what I presented originally, now with life-experience similar to the theme of the motif itself. Thanks to the saboteur. I couldn’t have done it without you! Maybe there is a story here about scars in life making us somehow more beautiful, if we are willing to take them and work with them.